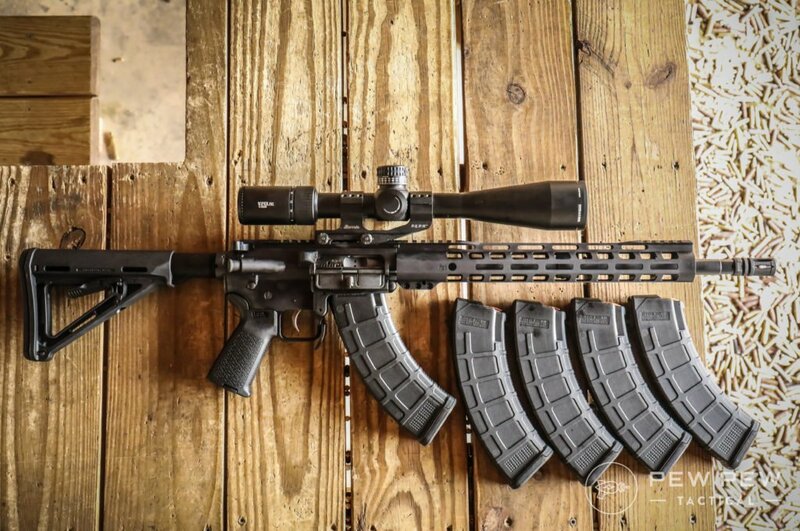 Want to combine the accuracy of an AR-15 with the power of an AK-47’s 7.62×39 round? 7.62×39 and an AR-15? Yes please! Why not just put a 7.62×39 upper on your AR? Let’s start off with why 7.62×39 is awesome, then dive into the best uppers and complete rifles out there. 7.62×39 is still one of the most popular cartridges around the world, as evidenced by the fact that you can pick up a box at the corner store no matter which hemisphere you’re in. It was originally designed by the Soviet Union in the latter months of WWII. The Soviets wanted an intermediate cartridge that could function in a multi-purpose capacity. What they got was a solid little round that would be on par with the 5.56×45 NATO rounds the West would use much later. 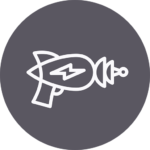 The new cartridge would go on to achieve wide acclaim for its success in close quarters combat thanks to its relatively large bullet size. Most 7.62x39mm bullets are 122 or 125gr, with some 150gr stuff available if you’re willing to really look for it. This puts it nearly on par with the modern .300 Blackout round, and indeed the 300BLK was designed to mimic the performance of the 7.62x39mm round in a lot of ways, but in a package that could be chambered by the AR-15 with minimal adjustment. So, here’s the takeaway from the bare-bones look at the specs. 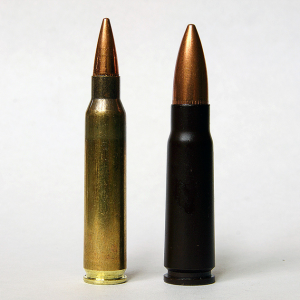 The 7.62×39 can load a bigger powder charge, but the 5.56×45 can be loaded to higher pressure. So, what’s that actually mean? Well, from a practical standpoint, the 7.62×39 round is going to carry more energy into its target inside 300 meters or so. But outside of that, energy falls off and the heavy round drops quickly. The 5.56 meanwhile is not as good on the stopping power front at close ranges. Having a lighter bullet it moves quite a bit faster, however, so after about 300 yards or so, you’ll get more energy out of it than the 7.62×39, and certainly more accurate. Let’s break that down further. If you’re hunting anything up to medium game inside of 300 yards, you’ll want the 7.62×39. It carries more energy and is plenty accurate at those ranges. If you’re going after smaller game, or are looking to make shots at 400+ yards, the extra accuracy, and velocity of the 5.56×45 is going to be fine. No need to invest in a new upper if that’s the case. Now, if you’re looking for something with a little more close-up power, or you just want something else to add to the collection, you might want to snag a new 7.62×39 upper for your rifle, or just build a 7.62×39 rifle from the ground up. If that sounds like something you want to do, here’s what we recommend for your new East-Meets-West rifle! If you’re looking for a firearm that’s basic, but functional, PSA has probably got you covered no matter what you’re looking for. They’ve certainly got you covered if you’re looking for an A2-style upper in 7.62×39. The barrel is a 16” chrome moly vanadium piece with a 1:10 twist, and it’s set up for a carbine-length gas system. The barrel has a combination front sight base/gas block, and is covered by standard handguards and capped off with an A2-style flash hider. The upper itself is forged 7075-T6 aluminum and then finished with a hard anodized coating to keep it free of scratches and rust. I’d call this upper the way to go if you’re looking for a basic 7.62×39 upper that is more about function than form. It’s finished well and machined precisely, don’t get me wrong, but unless you want to build an A2 clone in 7.62×39 for some reason, it’s pretty plain Jane and doesn’t really offer you much in the way of customization options by default. And that’s perfectly fine. A whitetail (or a home invader) isn’t going to care what the gun looks like, or how many flashlights and laser sights you’ve got hanging off it. The upper is as accurate as anything I’ve ever shot in 7.62×39, and I’d say it’s more than adequate for anything from hunting to plinking, to long-term storage for the end of days. What if “adequate” doesn’t quite get the job done though? Would if you need those flashlights, lasers, foregrips, PEQ boxes, and coffee grinders? What if you just plain hate the A2 stylings the upper above? Well, PSA has still got you covered. Their AR-47 16” is an M-LOK railed version of the PA47, and it’s perfect if you’re looking for a bit of an upgrade over the base model. You still have the 1:10 twist rifling, but with a mid-length gas system and a low-profile gas block to accommodate the free-floating, 13.5” inch PSA lightened M-Lok rail. You have M-lok cuts at the 3, 6, and 9, positions and a full-length rail up top, all ready and waiting for whatever accessories, grips, and optics your heart desires. The rail also features QD mounts for a sling if you so desire. Personally, I think a nice 1-6x like the Vortex Strike Eagle would look rather nice up there and would be perfect for the 7.62×39’s range, or maybe a good red dot and a flashlight for a home defense setup. Whatever you want to build, the PSA AR47 upper gives you the means to bring your vision to life. I love the customization options, and PSA has put some serious thought into this upper, from manufacturing to distribution. 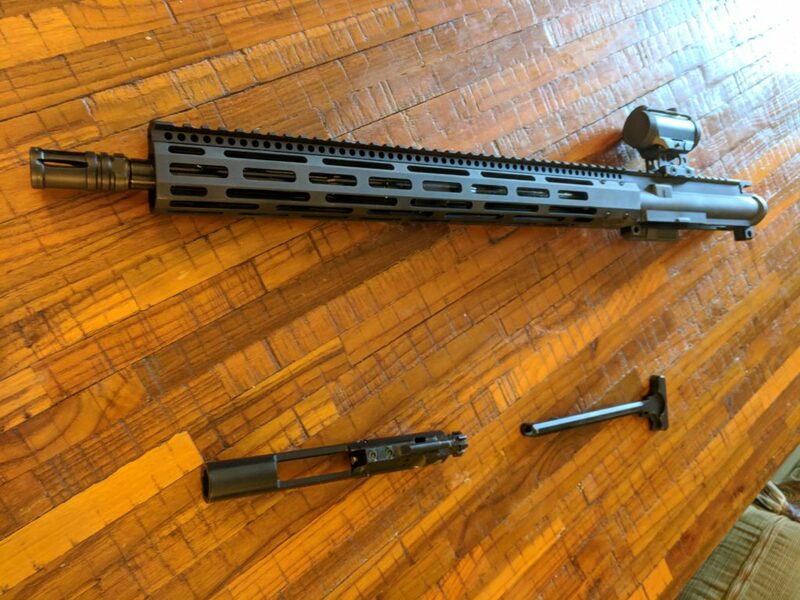 If you’re looking for something a little different that’s maybe a step up from the PSA stuff, the Radical Firearms HBAR upper may be the way to go. The HBAR-profile barrel is fitted with M4 feed ramps, and is rifled at a faster 1:8 twist to get more accuracy out of heavier bullets. It comes with a flat-top Keymod rail that will do just as well as the M-Lok stuff when it comes to supporting your favorite attachments and optics. You can read my full review of another Radical upper here if you want to know more about fit and finish. But in general you get what you pay for, and what you’re getting here is a competently designed and manufactured upper that manages to come in at an affordable price by skipping some of the bells and whistles like weight-saving measures and monolithic construction. The big advantage it has over the PSA uppers is the piston-drive gas system that runs a heck of a lot cleaner than the direct impingement PSA system. This is especially important if you’re shooting dirty surplus ammo. Cheap as that stuff is, it can foul a gun up quickly and though that may not matter so much to an AK, it certainly will to an AR. However, this upper doesn’t come with a BCG or charging handle – so take that into account when you budget it. You’ll want to get a dedicated 7.62×39 BCG and any standard AR-15 charging handle. 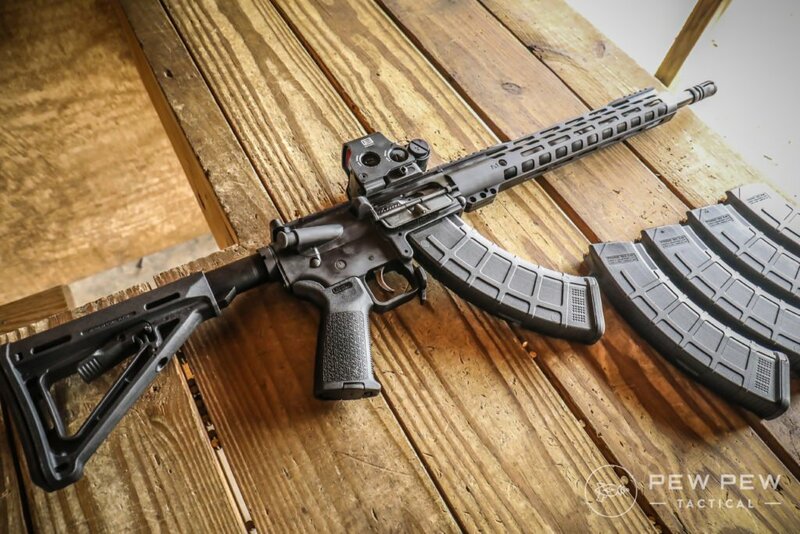 If you’re looking for a complete rifle option, the Mutant has you covered – but it isn’t cheap. Using the AR standard Direct Impingement gas system and using standard AK magazines, the Mutant truly is just a combination of an AK-47 and AR-15. Best of all it is made to CMMG’s exacting standards for quality. 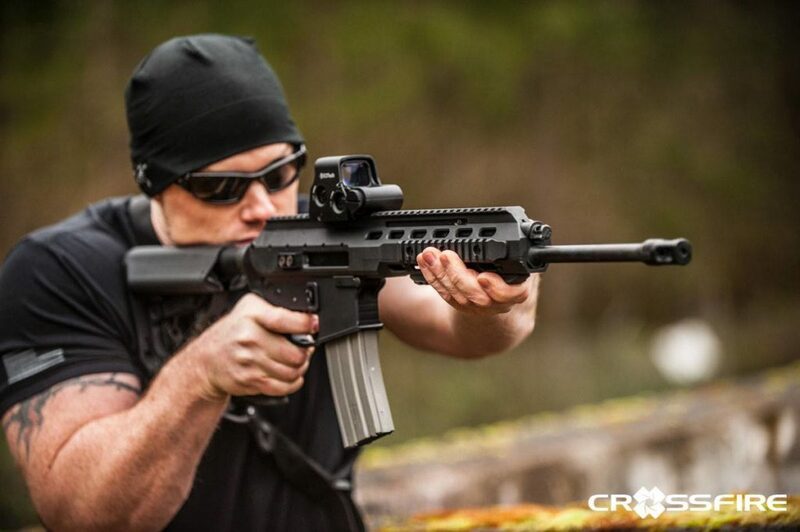 While the 7.62x39mm round is not a marksman cartridge, you can count on the CMMG rifle that fires it to be as close as can be to giving you maximum precision. Another complete upper option that comes in a piston flavor…complete with gas adjustment so you’re ready for whatever kind of ammo you might be shooting. It’s built almost completely different from a standard AR-15 upper so not that many parts are interchangeable. BUT…it does work on a regular lower. 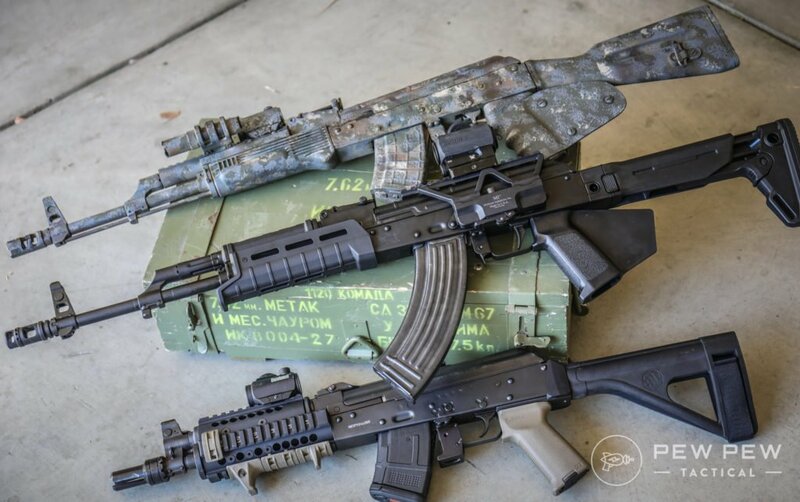 It’s a little heavy with integral quadrails but if you want to go piston like the AK…the ARAK-21 might be for you. All of the options before were great options, but the best of the batch might be the PSA KS-47. Delivering a complete rifle for a fraction of the cost that the CMMG runs…the PSA KS-47 is also outstandingly accurate. Shooting roughly 2.5 MOA, the KS-47 delivered perfect function and reliability. Impressive for a gun that runs about the price of most decent standard AR-15s. Full video review of ours right here! Another perk is that PSA offers it in several configurations, including a braced pistol version with a 10.5-inch barrel! The only downside is the lack of last round bolt hold open (thanks AK mags). If you want a complete rifle option, you can’t go wrong with PSA! See our full written review for even more details. What’s your take on the KS47? If you’re interested in 7.62×39 and you already have an AR-15, you’ll be pleased to know there are some great uppers out there that will allow you to take advantage of this legendary caliber’s benefits without building a whole new gun. That said, if you want to build a whole new gun in 7.62×39 and don’t want to build an AK, then you can just build a whole AR from the ground up. Whatever you decide to do, these uppers won’t let you down. They’re as rugged and dependable as the cartridge they fire, and you should be able to find one to meet your needs and your budget, no matter what those may be. Got another one I should add to the list? Think this whole thing is blasphemous and an insult to both Stoner and Kalashnikov? Or how about check out the Best AR-15s and Best AK-47s? The PSA 762×39 uppers will not work with a regular AR15 lower as per PSA in the description on the uppers page. What brand is the Magazine in the video and most of the photos? Do 7.62×39 mags fit the AR .223 magazine well? Yes, just make sure you get AR-15 magazines designed for 7.62×39. 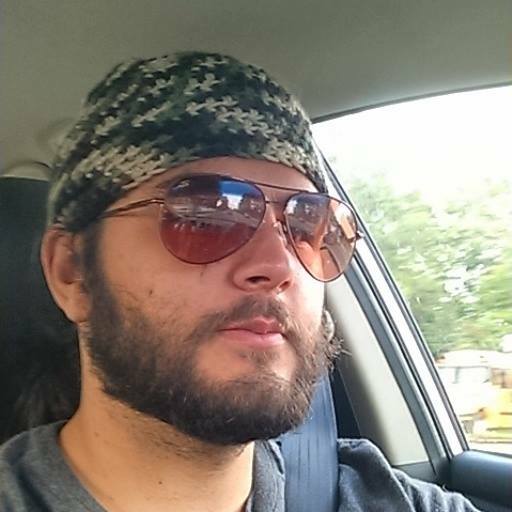 I saw a guy show up to the range once with AK magazines because they were the right caliber…he made a long drive and felt very foolish. I’m pretty dang happy with the basic BCA complete upper (~$180) I fitted to a DPMS lower a couple years ago. It’s been reliable and accurate for me right out the gate and to this day. Just shows you dont have to spend a lot to have some fun with this cartridge!